Specifically, the rabid Reich- Right-wing lunacy over 8 of the preceding 9 years, increasingly shrill now that they've lost both the White House and majority control of Congress, has painted a very uninformed, intellectually dishonest picture of the causes, effects and cures for all the major issues we now face. In order to make lasting change, the President must first plug the major damages, then shift public & policy perspectives via the Overton Window in order to set the stage for making lasting changes. Overton described a method for moving that window, thereby including previously excluded ideas, while excluding previously acceptable ideas. The technique relies on people promoting ideas even less acceptable than the previous "outer fringe" ideas. That makes those old fringe ideas look less extreme, and thereby acceptable. The idea is that priming the public with fringe ideas intended to be and remain unacceptable, will make the real target ideas seem more acceptable by comparison. Global Climate Change: Warming, Stagnant, Cooling Or What? Read more about Global Climate Change: Warming, Stagnant, Cooling Or What? I hope it works when embedded here. [ed. note - CM1] Bumped because today is a Blogger Action Day on climate change. Originally posted 2009-10-14 13:05:16 -0400. I think it was maybe a year ago I was flicking through cable TV, and I happened across a movie called "There Will Be Blood." There Will Be Blood is a 2007 American drama film directed, written and co-produced by Paul Thomas Anderson. The film is loosely based on the Upton Sinclair novel Oil! (1927). It tells the story of a silver-miner-turned-oil-man on a ruthless quest for wealth during Southern California's oil boom of the late 19th and early 20th centuries. I'd read a few books, watched a few documentaries and done a ton of internet research not long before this and had been slowly coming to the conclusion that we genuinely had a whole bunch of powerful people who knew that emissions of C02 were endangering the ability of life to survive on our planet. The frightening thing was many of these people were working hard to make sure we kept burning fossil fuels at ever increasing rates and making sure the transition to cleaner sources of energy never happened. I didn't really understand why though until I watched this movie and a few pennies dropped. Section 201 strengthens building codes so that by 2010 buildings will be 30% below the baseline energy code (IECC 2006 and ASHRAE 90.1-2004), increases that to 50% below the baseline energy code by 2014-2015, and adds an additional 5% reduction every three years after, out to 2029-2030. Whereas the 100 nuclear power plants only act as a replacement energy source, the updated building energy codes of Section 201 actually reduce energy consumption, eliminating the need for more plants. The codes also achieve more than six times the emissions reductions as 100 nuclear power plants. The codes accomplish all of this at a fraction of the cost. It appears that simply by being smarter about how we build our homes, businesses and various other structures, we can reduce our energy consumption and thus have a seriously positive effect on reducing GHGs as well as impacting energy and environmental goals. Open Thread -- "Oh When The Shark Bites..."
Scarlet billows start to spread..."
More information about the song Mac The Knife from Wikipedia. The county's first fatal shark attack in a half-century focused worldwide attention on a stretch of coastline with no history of shark activity. Read more about Open Thread -- "Oh When The Shark Bites..."
WASHINGTON, Jan 7 (Reuters) - The United States delayed a decision on whether global warming threatens polar bears, saying on Monday new data and public comment required more time. Environmentalists vowed to sue for quicker action. Apparently, while denying that the potential reason for the exception was that "substantial scientific uncertainty" existed with regard to the threat to the bears, no really adequate answer was provided, and the head of the U.S. Fish and Wildlife Service said it would take "as much as a month" to analyze all the pertinent details. well, a few weeks ago, the dept. 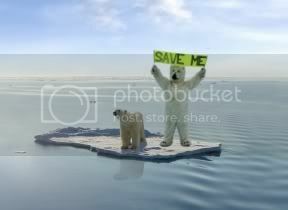 of interior finally pulled its head out and put out a proposal to list polar bears as a threatened under the endangered species act ... gee, i wonder what convinced them? was it the reports of polar bear drownings or was it the cannibalism? You can check the link to the blog for three action sites where you can either sign a pre-written letter or add one of your own. the U.S. Fish and Wildlife Service was due to make a decision about its "threatened" status by this Wednesday. The Service has, however, delayed the listing for up to one month! Does anyone smell a rat burning Bush in the room? Whether meteorological or economic in nature, the stormy weather being felt in parts of the nation today may simply be a brief taste of what is to come. Severe storms that have brought heavy rain, snow and high winds to California, Nevada, Utah and Colorado claimed their first victim and probably triggered a levee break Saturday. Every so often, a video comes around that makes a simple, straightforward, no bullsh!t case for using logic.